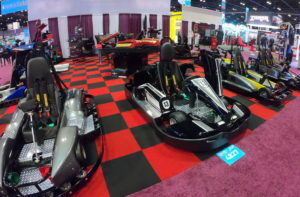 November, 2018 – Shaller GoKarts, the #1 Concession GoKart manufacturer in the U.S.A., proudly unveiled their new high-speed go kart, The Maverick, at the 2018 IAPPA convention in Orlando, FL. The Maverick is a first for American-made karts, a European style kart built with the strength to stand up to hard-driving U.S. customers. This kart is fast, delivering the driver a true racing experience. But The Maverick is also strong, so it stays on the course earning entertainment centers revenue every day. This is a kart that will revolutionize the way FEC’s and go kart tracks think about American karts. Shaller manufacturers The Maverick and all their other gas and electric karts at their facility in Schulenburg, Texas.